During dinner at Chez Harry, he lamented that he had not yet received a Christmas card from his brother. Lou is living in an assisted living center in LA. This allowed Harry to riff about an article that he had read. A Florida woman also in assisted living had been killed by an alligator, as she wandered the grounds unattended. This dark story morphed from this photo. Originally, I was going to do a political post, but found that idea too depressing. Hence, this dark tale. Something more Christmassy would have been better. I was thinking about a politicized version of Twelve Days, but that has been done and nothing else came to mind. I took this picture during this year’s first shutdown. 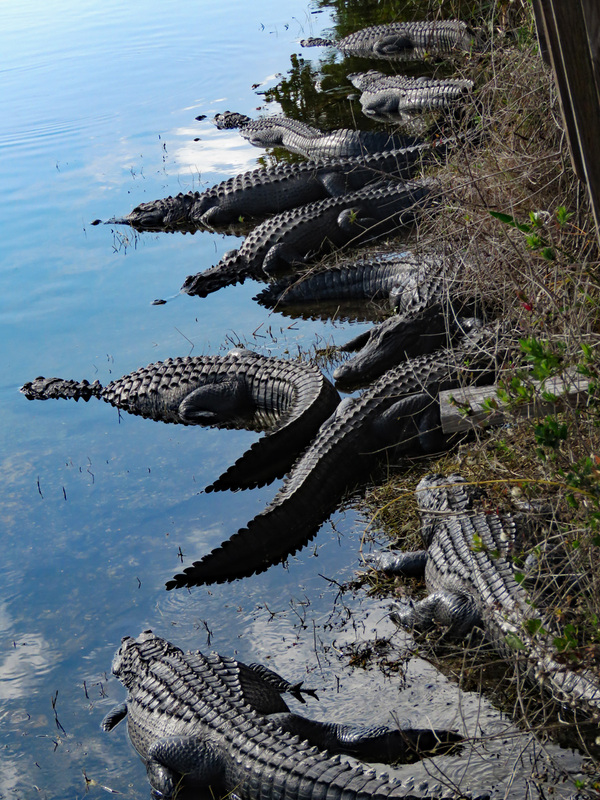 We were at a National Forest Service site along that apply named stretch of I-75 called Alligator Highway. Running east-west along the northern boundary of the Everglades, it is dotted with commercial alligator farms and this government-run one too. Its center was closed, but the parking lot was open. In addition to gators along its banks, the pond was well stocked with Florida gar. I don’t see how so many predators could co-exist in such a small body of water, without some feeding be done, but with the shutdown, there was no one to ask. As I was relating this chain of thought and at the mention of the gar, Harry was moved to quote the fist line of Beowulf in Old English, “Hwæt! We Gardenav in geardagum.” Which means, “What! We of the Spear-Danes in days-of-yore,” with gar being the word spear, I guess because of their shape. Harry’s recitation caused Bubs to comment, “I don’t understand what you are saying.” I quipped that I was surprised that she didn’t understand Old English, which was mean. Bubs also said that she was glad that she lived in Michigan, away from all of these dangerous animals. We talked about how invasive pythons are now eating the gators. Anne mentioned that armadillos have now migrated into Saint Louis County and I added that Mountain lions have been spotted too. I recalled a much earlier trip to southern Florida. It was a business trip. Most of the land south of Lake Okeechobee is swamp and most of that is government-owned. Nestled in this wilderness is a test facility. When I was there, two hunting hounds, both with radio tracking collars came stumbling out of the swamp. One of them had a bloody gash along its side. My host scooped them up, put them into the back of his truck and carted them down to the front gate, to await their owner’s expected arrival. No telling what caused the dog’s wound, but it could have been an alligator. My host recounted a story of one dark and rainy night, when he was leaving work and spied a huge gator crossing the road before him. It was longer than the road was wide. Not a good time for a flat. Thanks for that bit of insight into the home life.